How Big Were Canadian Upstream Spending Cuts in 2015? In light of the commodity price downturn that began in 2014, almost every oil and gas company in Canada cut spending in 2015, with focus quickly switching from large scale development of properties to eliminating non-critical expenditures and merely sustaining production as much as possible to survive in the low price environment. But just how big were these cuts? 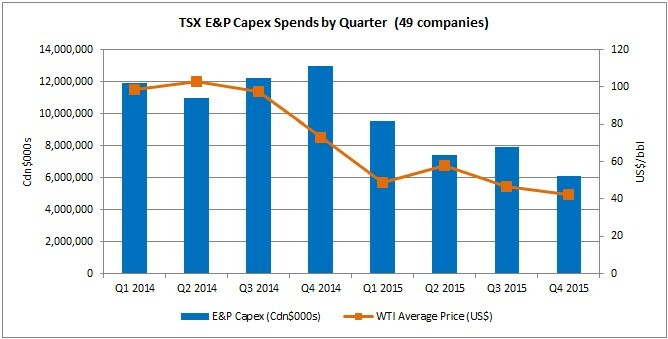 New analysis of annual results from CanOils shows that 49 TSX-listed oil and gas producers reduced their annual upstream spending by an average of 36% in 2015 as they sought to deal with consistently lower commodity prices compared with a year earlier. The total combined upstream spending (see note 1) over the whole of 2015 for these 49 TSX-listed E&P companies that had reported their annual capex spends for 2015 as of March 15, 2016 was Cdn$30.9 billion, compared to Cdn$48.1 billion in 2014. Of course, the biggest producers on the TSX will have a greater impact on the above chart than smaller companies, as they have spent much larger sums over the past two years. 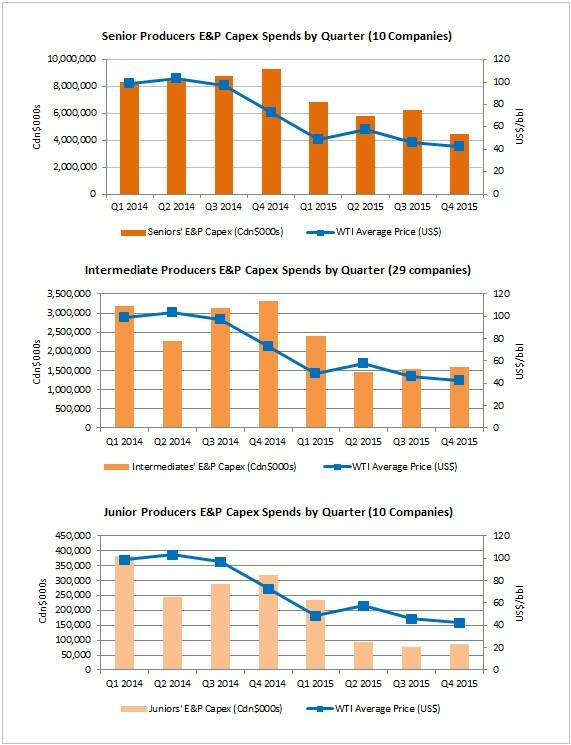 To get a clearer look at how the upstream companies on the TSX have adjusted their spending patterns in light of the oil price downturn, we have split the companies into three distinct peer groups: Senior Producers (companies that produce over 100,000 boe/d), Intermediate Producers (between 10,000-100,000 boe/d) and Junior Producers (under 10,000 boe/d) – see note 4. Again, the combined spending in Cdn$ of each group is plotted in the charts below alongside the WTI price in US$. It is interesting to note the delay in the reaction time to the falling price. When the price downturn had really started to take hold during Q4 2014, all three peer groups actually increased their spending from Q3 2014 levels; the senior and intermediate peer groups actually recorded their highest combined quarterly spends over the past two years in Q4 2014, when the oil price was rapidly moving in the other direction. Presumably, cash that was long-committed into certain projects and could not be reallocated, and the time taken to identify and then implement a new strategy away from non-essential spending both played a role in this delayed reaction. Also, it was highly uncertain whether or not lower prices would be a long term issue at the start of the downturn, with many companies not having an immediate need to react by cutting production or spending at all. It was a completely different story throughout 2015 however, with all three groups cutting spending across the board. It was the junior producers that reacted to the most drastic extent in terms of spending cuts; there were 8 juniors in the group of 10 that cut their full-year spending in 2015 compared with 2014 and the average reduction in spending for those 8 companies was 68%. In contrast, the senior and intermediate producers only cut their combined full-year spending by 36% and 43% respectively. 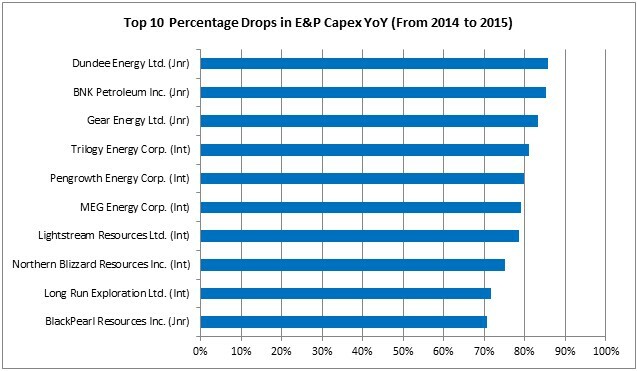 MEG Energy Inc. (TSX:MEG) – the biggest producer in the top 10 spending cuts chart above – lowered its capex by the sixth highest degree of the 49 companies in 2015; MEG’s spending was cut by 79% to Cdn$271 million from Cdn$1.24 billion a year before. Unlike the other producers in the chart, however, MEG is unlikely to see any major impact to its production levels going forwards because of this spending cut. The other companies in the chart are mainly involved in Western Canadian resource plays, where major, constant drilling and development work is often required to even maintain production at a certain level for extended periods of time. MEG, on the other hand, is an insitu oilsands producer and will benefit from the low-decline nature of production associated with that resource. MEG invested heavily in its existing oilsands project phases and implemented key cost-cutting and efficiency measures over the past few years, meaning it can now sit back while prices are low and invest a relatively lower amount to keep production steady for many years ahead. 1) Total upstream spending throughout this article relates to exploration and development activities only. Any spending related to acquisitions or divestitures of either proven properties or businesses/business segments is excluded. 2) The WTI price is included in four of the five charts in this article in US dollars for reference purposes. The price data is sourced from CanOils’ new markets product, which provides historic coverage of selected oil and gas benchmark spot and futures prices as far back as 1988. 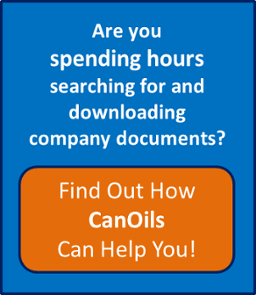 3) All company data is sourced from CanOils, which provides quarterly financial and operating data for TSX and TSX-V listed companies back to 2002. Find out more here. 4) The full list of 49 companies included in this article can be found here. The companies were placed into their production peer groups based on their annual average daily oil and gas production in the full year 2015.